Today I finished another handpainted wood slice brooch, this one featuring a grinning Jack O' Lantern a.k.a Pumpkinhead guy flying through the skies grasping a large Corn Candy. 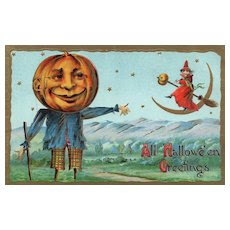 I love the Pumpkinhead character that first emerged in early American postcards. 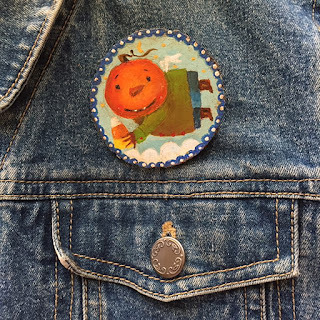 He embodies whimsical fun and humor and thus figures in many a contemporary folk-art Halloween artist's work. In fact even famed artist Jamie Wyeth painted a startling self-portrait aptly titled: "Pumpkinhead". For me this big, bright orange member of the gourd family also symbolizes prosperity, it's seeds easily grow more pumpkins even if tossed in a compose heap, it's pulp offers up enriched delights from pie, to breads to smoothies and it's empty shell with a glowing candle within provides a guiding light for Trick or Treaters, and oh! Don't forget the most popular Fall flavor in a Starbuck's latte. The fun for me in creating this fat headed creature lies in the pure delight that he can be a she, dressed or undressed, scary or happy, whatever my imagination dreams up, goes, restrictions don't apply. As a self-professed holiday freak, his presence is welcome all year long in my home. Vintage postcards featuring Pumpkinhead guy is a sought-after treasure for Halloween, ephemera and early Americana collectors, although prices vary, still just one card can demand a decent amount of cash to be forked over. Have you ever drawn the Pumpkinhead guy? I look forward to your rendition, just post in comments section below!